Fiona Bruce and the team head to Caversham Park near Reading, where some 19th-century watercolour illustrations are brought for valuation. Browse content similar to BBC Caversham Park 1. Check below for episodes and series from the same categories and more! and this location is very rarely open to visitors. This imposing Victorian exterior hides a bit of a surprise inside. at Caversham Park near Reading. excited to be here, because it plays a vital role in our news broadcasts. more than 2,000 individual media sources. and highlight to the government any propaganda or spin. and was an avid customer of BBC Monitoring. "What's that fellow been saying?" carrying nuclear missiles to Cuba. of Saddam Hussein in 2003.
here to meet our experts. I'm pretty sure they'll have a few revelations of their own to pass on. which date back to about 1800, 1810. And have you had them in your family since then? He is the latest generation to have it. in Newington Road, Edinburgh. They were not models to play with. whereas I had other sort of cardboard ones which I played with. That's how I would have seen them. at the time of the Napoleonic Wars. And do you know what they're made of? -They're probably made of mutton bone. and there was an industry in those prison camps of model-making. thought that people that were occupied were less trouble. it's probable that the model makers in this case were sailors. And they were making sort of generic models of ships that they'd been on. This one, of course, is a lovely ship, but this one is the gem. The metal for the guns were probably again begged, borrowed, stolen. You've got wonderful detail here, you've got a beautiful figurehead. I mean, they are fantastic and they are very collectable. -..in one of those auctions. With a little restoration maybe even ten. they are prisoner of war, they are fantastic. in fact, because it's a hound. obviously, sizeable sculpture as well, which is actually cast-iron. It's been in my husband's family for over 100 years. They were the inventors and manufacturers of plasticine. used to travel all around the world showing it. and they were doing a house sale. although he only got the one and that they were a gift from Napoleon. So, that sounds really interesting. Well, an amazing claim to fame, for a start. that my family had invented plasticine. I think you're absolutely right about it being one of a pair. then certainly they were made to be opposed. There would have been another one. so it's a French hunting dog. We can see there are kind of flakes of it peeling off. I think date wise, 19, late 19th century. I'm a little bit sceptical about the Napoleon story. -So the question is, who is it by? I can't see any initials. by a gentleman called Henri Jacquemart. And this, actually, is a fairly reasonable copy of one of them. but it's still a very, very good thing. And I'm sure it looks lovely in your hallway. -it would make £2,000 to £3,000. Well, it's not going anywhere, it's part of the family. It's obviously got a great family history with it. because he still wouldn't be here, would he? -Right, thank you very much. do you know what I first thought it was? I thought it was a vulture. but when I saw it I thought, "This can't be a vulture." No-one would want to wear a vulture. you see that it is, of course, a songbird. What it is, it's a bird catching the worm. -It's a novelty. Isn't it? I wouldn't say no to putting it on my lapel. brooches are not everyone's cup of tea. the right occasion to wear it, haven't you? -Did you ever wonder what it was, what it was made of? I'd sort of have a rummage. I've seen it's got a mark on the back. So I presume it's some sort of gold. -I've mentioned to you that it's got a pearl in the middle. -describing it as a vulture's wings. But you know what I mean. -And the head is textured. And there's a little eye, set with a ruby. -And there's a little worm. novelty brooches were all the rage. birds, robins with their, you know, nests with pearls forming the eggs. -You know what I mean? Jewellery then was made with this novelty factor in mind. They were very, very popular. And they sold extremely well. Now, you mentioned that there was a mark on the back, didn't you? -If I turn it over, we can see there is the hallmark. -It was hallmarked in London in 1954.
we also have a diamond at the end of the branch. So, we're not talking about a bit of costume jewellery. It's gold, it's diamond, it's ruby, and it's pearl. Now, you've also brought along the box. ..we see that actually it fits perfectly into the box. They're red hot. Would you like me to tell you what I think it's worth? -And you've brought me the oldest things I've seen today. and so that's really been my passion from there. brought up to the surface. And what we're looking at here is the sophistication of the Romans. And what I love about it is just holding it. You imagine this in a Roman villa. Probably this painted piece of pottery. but this piece of pottery tells their story. And you've got coins here, you've got brooches, you've got rings. Whole little glimpses of Roman life. Exactly. It just tells the story, piece by piece, basically. Of course, in terms of value, it is a very difficult collection to sell. you might find two enthusiasts like yourself who'd go to maybe £100. and I remember it sitting in the front parlour. It's a type of Chinese ware that was called sort of famille rose. I think it is worth today probably about £300 or £400. ..I think it would be upwards of half a million. have you ever thought of washing it? Well, don't... Anybody got any radish seeds? Because we could actually grow stuff in here. There's so much filth in here! Can I ask how much you paid for this at auction? We paid £40 for it. Whether it's a genuine Meissen or whether it's a good copy. -So is it £40, is it £44,000? I'm glad you're sitting down. it would be speaking Chinese. that have quite recently come out. But he was extremely popular in his day as well. -..who wrote to him as a fan? and I know he was a fan of the Hobbit originally. And he read the books as they came out. to really ask some complex and nuanced questions. taken the time to answer and provide some background. There's two letters. First letter is eight pages long. and a lot of those questions have been answered. I mean, if we just go to the first letter. He says, "Thank you very much for your letter, there was no need to apologise for it." a sort of famous person and taking up their time. "It's a very handsome and pleasing compliment." So he obviously enjoyed the letter. and then goes on to take up eight pages. "the Silmarillion and other legends of the First and Second Ages." So he's talking about the book. He's an author, he's mentioning his books in the first paragraph. to some of the questions that your father asked. where he mentions Gimli, he mentions Legolas, and so the letter goes on. refer to if he wants to study it in even more depth. These are really, really important letters. Let's go to the smaller one first. With its original envelope, £3,000-£4,000. I think you could be looking at £10,000. you might be looking at somewhere between £500 and £1,000. if it came up for auction, making £10,000-£15,000. -What do you call it? Because it's always had blankets in it. As a child, it had blankets in it in our family house. And then my mother remembers it with blankets in it. because she had the attic bedroom with her sister. -she always thought it had a body in it. -and grab hold of them on their way to bed. Well, I love a piece of furniture with a date on it. The question is, is it right? put onto an older box, or whether that's the date of the whole box. So, I don't know! Perhaps you can tell me? -The coffer itself is of an earlier date. quite sort of humble and, you know, made out of, really, chunks of oak. And yet, the front of it is so much more refined, isn't it? -It's quite a sort of juxtaposition. And yet it hangs together quite well, doesn't it? So, in fact, I think it's really three different dates. -that doesn't change much over the centuries. But what was it commemorating? Was it the coming of age of Ellen Eggers? Is it a marriage chest? The burning question, then, I suppose, is what's it worth? Lovely. I mean, not that we are going to sell it, we never would. It'll be in the family, I should think, for generations to come. Please tell me you didn't steal this from the Queens Arms in Goring? We ran the Queens Arms for nine and a half years during the 1990s. when he knew he was going to retire from the business. Two went to locals, who as far as I know still have them. And the other ten he sold to a collector. he decided to offer it to us, being the tenants at the time, first. I've got a receipt at home for £140. That'll be an assay stamp. I'm testing your publican's knowledge, you see. It is. This is the excise office stamp to prove that it was a pint. -But the ER is for Edward VII. But any idea what 71 is? That will be the number of the local office. You obviously did your publican's exam. So, the next question is, where is the local office for 71? Ah, now, I don't know that. Well, it's not in Goring, it's in Newcastle upon Tyne, where I'm from. -So, it's the Geordie mug. and one of the biggest potteries in the world. -Imagine going to the pub now and being given one of these. You just wouldn't! the barman would probably know the names of everybody who drank from each one. -it would end up in an American collection. You've got ten of them. They are worth, well, you can put a zero on the end of that. -So they're worth £100 to £150 apiece. -So we should be celebrating with a beer, shouldn't we? my eyes just about popped out of my head when I saw it. Much like the bulging eyes of this fish. Tell me what you know about it before I go into a bit more detail. other than originally it belonged to my grandparents. -When he died, it passed onto my father. And now my sister and I have got it. -We know it's got hallmarks on it and it's 19th century. -Good point. It is a drinking vessel. -But it's for serving drink. -So it's actually a claret jug. looking very, very good indeed. -But you mentioned it's got marks on it. -We'll have a look at these right now. They are on the front. When I saw it, I was hoping these were the marks I was going to see. -It's by a very important silversmith. -And he specialised in exotic claret jugs like this. And he did parakeets, we've seen, all sorts of strange animals. This is a carp, as you probably know. The eyes are made with glass. Alexander Crichton, London hallmarked, 1882. -So, again, that's bang on what we would expect. He started in about the 1870s. So it ties in just nicely. The body is made of glass. who made glass scent bottles and other things. -But it's just such an exotic-looking thing, isn't it? What do you do with it, if you didn't know it's a drinking thing? and we've got loads of photographs and in the background is this fish. when you get home, see what it looks like. I'm sure it'll look very good. -My husband loves a drop of red wine. We've got to come to pricing it. -They only appear very rarely on the market. So we're talking a substantial amount of money. What did you think, yourself? We haven't really got any idea, have we? So we're looking at a value of around about £10,000-£15,000. It's got everything that you could possibly want. local museum, this time by our specialist, Adam Schoon. only one of which is correct. It's certainly not obvious-looking at it, Adam. -So give us your first definition, then. Well, look, I'd better tell you, it's made of chrome coated brass. It's very sleek, futuristic item. And the first item it could be is a 1920s pilot's chamberpot. Now, I know you're taken aback by that. Well, wash your hands afterwards! There's nothing in there, I can tell you now. You did your stuff and of course, a good, tight finish. And someone thought, I know, I'll have my chamberpot mounted? Yeah, I know, it appears trophy-like. -So now that's got you slightly baffled, I can tell. -I'm wondering if it's actually watertight. -OK. So, a pilot's chamberpot. The second potential is as a 1920s prototype Bentley ashtray. -I love the sound of that already! in your fabulous convertible, this is just what you needed. Clipped to the dashboard, easily emptied. But obviously, an anti-wind device. OK, let's have the last suggestion, then. Well, the last is very much relevant to where we are today. This is one of the first BBC sports championship trophies. Awarded, believe it or not, here at Reading Golf Club in 1919.
on the back of the pedestal base. Right, what do we think, folks? Not big enough for a wee? I'm so taken with that, I've forgotten... What was the second one? -Yeah, I'm going with that. it doesn't show any sign of where it was attached. You can see there's some denting and plenty of wear and tear. OK. Or a golf trophy. -Why would it have a lid? Why would it have a lid? It's not containing the ashes, after all. The golf trophy? We don't care about the golf trophy. We're not buying that, Adam. contraption, or a Bentley ashtray. More are people going for the Bentley. OK.
That's what the majority are going with. I'm listening to the voice of the people. that would have gone to the external part of the aircraft. and we were lent this very kindly by the Museum of Berkshire Aviation. and actually behold this rare object for yourself. so we know where it's come from and obviously the job it did. So, yeah, caught you out. My goodness, is this a good thing! You showed this to me. in what is almost certainly a 17th-century hand. and lived at Caversham Court. and he amassed a library of 2,500 volumes. And I suspect that this probably came down through the family from him. It just appeared with my mother's belongings. And she had a lot of books, and there it was. And I'd never seen it before. this is somebody making notes in the same century as Shakespeare. about him, is of huge interest. And he's copying out quotes from various Shakespeare plays. This is... This is incredible. and what their reactions were, what they were focusing on. who was reading Shakespeare and making notes. -In this incredibly tiny hand. It's almost completely illegible, but you can pick out the odd word. And you can pick out phrases that appear in Shakespeare. There's a little quote here from Twelfth Night. Where he says, where is it? "and make thy doublet of changeable taffeta. And this is a quote from Twelfth Night. It's an extraordinary little object. It's made of an old piece of music. There's this curious seal. I mean, what do you make of this? or where he comes in, or why it should have been sealed anyway? maybe this person was a student. There is so much research that can be done on this item. My hands are trembling now. Now, the size is marvellous as well. It's such a perfect little jewel. -And I think it was probably carried around in a pocket. It would have been his bedtime reading. It could indeed. By candlelight. Although he probably went blind, I think! The value to scholarship is enormous. the commercial value also has to be great. Interest has never been greater. I think at auction you can see this making easily upwards of £30,000. Really? For such a small item. to a pair that I used to have way back in the 1950s. And I remember having to nail in the studs myself when they got worn out. But also, interesting enough, they are actually signed, M Busby. Matt Busby gave them to me in May of 1958. He was a great friend of my grandfather's. And they were in his personal luggage. And that's how I came to get them. -they tried to take off twice and couldn't. Third time, they just never actually took off. -Including eight members of the first team. so he decided not to go. And he was absolutely devastated afterwards. Because Matt Busby had been a friend of his since 1928. "can you find him digs and take him to the club,"
and he met an 18-year-old Matt Busby off the train at Manchester. And that's how the friendship developed. and probably the best team in the world. And as a family, we got to know them very well. he was still on crutches. He was still injured a few months after Munich. which was very good of him. So, this one is a letter to you. How old were you then in '62? And he'd got all the first team to sign. -He found the great George Best. -Bobby Charlton played there. I mean, what a fantastic team. because it's great to see things you've never seen before. And then we have to think about value. I'm a United fan. They'll stay with me. -Well, I know they're cloisonne. What do you think you mean by the word cloisonne? Well, I do know what it is. -very intricate work, and they're called cloisons. to make this beautiful, beautiful finish. You've been listening to me on the Roadshow! No, my father told me what they were. I mean, you couldn't... You got it perfectly. and a cylindrical box and cover. -but not meant to go together. doctors to go somewhere very quiet, so he went to Cornwall. from country house sales and I think that's maybe where it came from. -When was this, year wise? -Mid-20s, I would have thought. Interesting. What's going on here? What is the decorative motif that we've got on this particular object? OK, bees. Yeah, go on. And there's... There's a Chinese insignia in the middle. ..bordered pattern and blue inside. And we have these, what we call, false gadroons on the edge. I have to do is pick you up on your entomology, I'm afraid. They're very badly designed lotuses. -That is what they are. of the word shu, which means happiness. I think we're looking at something around the 1920s, 1930s. -1895, 1900, somewhere around there. So, where are we in price? objects, even if they're not terribly old. -Both singles or pairs, we have? -This one is one of a pair. -That's one of a pair. Right, OK. And that's a single. A pair of those would make £2,000-3,000. And that one would probably make 1,500 to 2,500 on its own. would have given their eye teeth for. -But a letter from David Bowie. But I understand you didn't really appreciate it at the time. and was quite surprised when this arrived through the post for me. So, I'll just read a little bit out of it here. It says, "Hi, Ruth..." which is you, obviously. "a great friend of mine. "and might want a little bit of cheering up." to write the letter to you? I just thought, "I'll go and see if he's there,"
"I've got this through the post, is it really off him?" And John said, "Yeah, I've been working with him in London." So he, sort of, verified it for me that it was. -and I think that's something he was very well known for. And this is a very personal letter. so that would have been sort of 1974. And, you know, if you'd like one, he'll send you one. And then he, sort of, signs off, "Lots o' luck, love-on ya!" all those, sort of, 1970s references. You know, he was at the absolute height of his fame then. this personal letter to you. from David Bowie and they are typed and perhaps signed by him. you're probably looking in the region of £800-1,200 on it. Have you got a story about your brush with celebrity? we've featured memorable tales like The Day I Met The Beatles. in your family house and what was he playing? Well, amongst other things, Hey Jude. We've seen lavish gifts given by stars of the silver screen. Well, my father was in the film business. He was a director of photography. And this is a watch that was given to him by Sophia Loren. My mother was a puppeteer, who worked for the BBC in the 1950s. Woodentops. That was her life. screen and the music world. this ring really does evoke a part of history that is just incredible. you can feel the weight of it and it's pure gold. when there were about 100,000 miners in there. It arrived in a little silk purse. -In this pouch, it arrived? Through the post - the ring and the letter. And that's all we really know about it. So, he went to find his riches, did he? ..and I would love you to read it. but you're going to read to us what it says. "and I would like to allow you ten shillings a week for your life. "We have some idea of returning to Coventry. "We intend leaving California next April. "Tell me all about my sisters and brothers. "My daughters are very handsome. "They are invited to the first balls and parties. "The view above is where they first found gold. "This is a wonderful country. "Some men make great fortunes and some can barely live. "Some rich today and beggars tomorrow." Gosh! I mean, that just gives me goose bumps. singing, you know, I Was Born Under a Wand'rin' Star. Incredibly intrepid and they came from Coventry originally? It must be... Well, a maid earnt about £7 a year. -Gosh. And this equated to £25 a year. of California in 1848 is just incredible! it's about the social history that it represents. But in auction, it would be in around about £400. wants to collect this part of history. It's a very important part of our history. -So, thank you very much. A beautiful Simon and Halbig doll of around 1880. -But she swims, doesn't she? -My mother was born in 1903. -So she must have had it a few years after that. But she's made of cork, which is obviously why she floats. because she is rather special. she did allow you to use her at bath time occasionally. -Does she have a name? -Belinda. What a lovely name! But, anyway, she is Belinda. -Shall we wind her up and see what happens? -She has the most amazing swimming action, doesn't she? -And it really does work. She's actually quite a collectable thing. there's every chance you would make around about £400-£600. -You're not going to sell her, are you? -She's going to my granddaughter. -put her in the bath. you've brought us in to look at today. The coalition troops that were sent there. That's right. ..that were sent there. What do you know about it? Not very much. I know it's a Dragon robe. -I believe that that's what it's called. that's gone into this and indeed the work that's gone into it. And you are absolutely right it is a dragon robe. so towards the end of the 19th century. and it's fairly obvious that's when he picked it up. this ferocious dragon and he's got, as you say, these five claws. and you've got these lovely flaming pearls. around the top and these happiness symbols there also. than the date would suggest. the more confidence that it's given me. It's stored in a suitcase in my dad's loft. That might suggest why it survived in such great condition. Look, it's a wonderful piece. It probably deserves to be out. a dressing gown or something like that. But as I said earlier, it might be too understated for you. Lovely. Yeah, that's really nice. Really good. you see all manner of things from period and antique and exquisite. so beautifully elegant and perfect. So perfect that they look as if they could have been made yesterday. of these two beautiful silver flower baskets? and several other bits and pieces. Do you know who they're by? I mean, she was 93 when she died. he brought these back for his wife, her mother. What you are looking at, for me, is a real heart-stop moment. of the 20th century, a gentleman called Joseph Hoffmann. -beyond that, he was all-encompassing as a designer. -He was part of the Vienna Secessionist movement. he met the great Charles Rennie Mackintosh. And many people have the debate of who influenced whom. -And yours are solid silver. which is the Wiener Werkstaette mark. -which is the Wiener Werkstaette rose. We've got to talk price. -No, I'm not, because it's £8,000 each. I don't joke about things like this, you know. within these amazing volumes of Indian watercolours. he went to the Crimean War first of all. so I don't think he acquired the books then. And what an illustrious career. Henry George White, Major-General. There's his armorial. these were done in the south of India. started to do these figurative studies. were done in around 1810.
over his shoulders, and they're smoking a very unusual form of pipe. So there's great detail in the sky. There's just so many. I mean, there's all sorts of trades. Like, there's some of goldsmiths operating some sort of trade. But I mean, there's two volumes and I think there's 49 altogether. -That's what we counted, yes. Again, with the book plate. Some of them are just awash with gold leaf. Indian dancer with two musicians. is covered in gold leaf and little flower heads. But they're an amazing condition. I mean, where have they been? because my father spent almost his entire life abroad. Well, my wife pulled them out, and said, "Wow!" I mean, that's what you brought them here for. or done any sort of research? I'm afraid I have absolutely no idea at all. so my auction estimate would be between £50-80,000. if they were more than £100! I think they had a dead cert there. Well, thank you very much for all your expertise. will be relocated to London. I want to share something with you that I've learnt today. from about the 1920s until about 2006. So some of mine will be in there, which is a bit of a shock to me. which I thought you'd like to see. and the first item in her file is when she was nine and a half. "and has no idea, fortunately, how good she is. "for so young a child. "And I imagine in the States she would be a top-liner." And of such thing, legends are made. Julie Andrews. What about that? From here at Caversham and the whole Roadshow team, bye-bye. 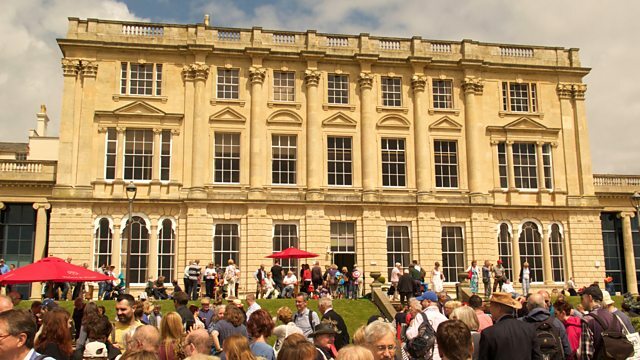 Fiona Bruce and the team head to Caversham Park near Reading which, since World War II, was home to the BBC's Monitoring service, where many news stories were broken by the team who listened in to international broadcasts. It is a busy day for the experts who specialise in written documents, as they examine items such as a very rare booklet containing notes made in the 17th century by one of Shakespeare's earliest readers. A chunky gold ring complete with a moving letter tells the story of a British family that joined the Californian gold rush in search of personal fortune in 1848. But star item of the day must go to some beautiful watercolour illustrations made in the early 19th century depicting people in southern India. After being told the jaw-dropping valuation, a stunned owner tells viewers that he promised the grandchildren an ice cream if the illustrations were worth more than Â£100.